Walter Sea of Camper & Nicholsons has introduced the news of his signing the 42.3m sportsfisherman superyacht Mea Culpa for sale. "I fished aboard her last week and caught a billfish so I can testify as to her abilities," says Sea. 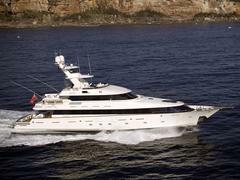 One of the largest yachts of her kind currently available, Mea Culpa was built by McMullen & Wing in 2003. She boasts a flybridge and skylounge along with spacious guest accommodation in a master on the main deck, two doubles and a twin. Available to view at the Fort Lauderdale Boat Show, the superyacht's asking $23 million.